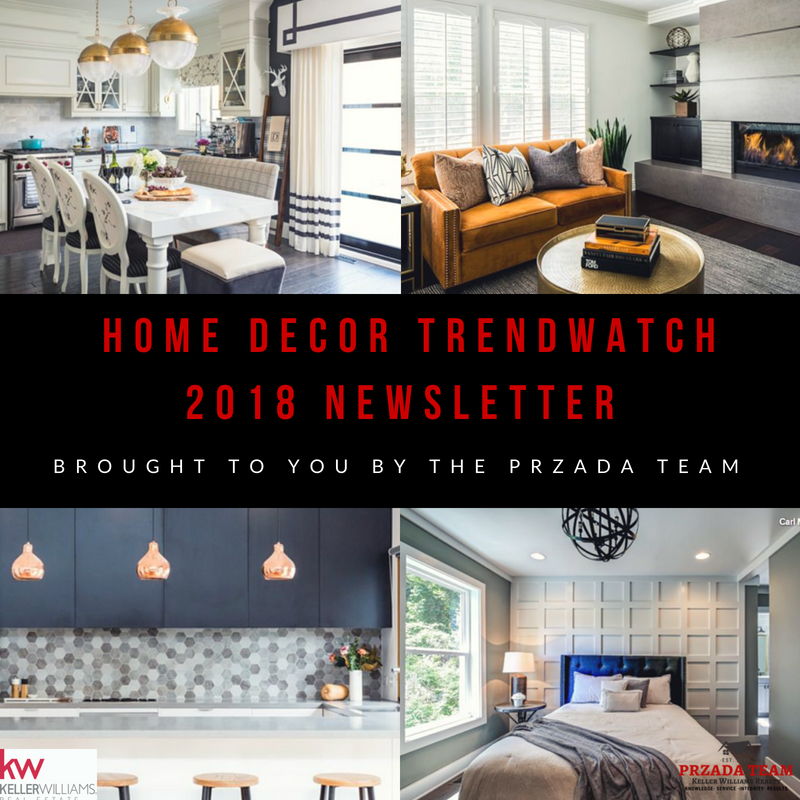 Welcome back TEAM-PRZADA Clients & Friends to our Annual Home Décor Trend Watch! 2018 is now in-full swing, and so are the décor trends. Here at TEAM-PRZADA, we tend to skew more towards moderation in all things, especially trends, but it is nice to know what they are. YOU can decide whether or not you wish to let this year’s trends be inspiration or to fully embrace those new ideas and replicate them in your abode. Whichever manner you wish to proceed, TEAM-PRZADA considers it a privilege to keep you up to date on all things real estate…trends, décor, real estate stats, homeowner questions, you name it…call us! We surveyed a variety of sources and found from HouseBeautiful to Pinterest to Elle Décor to Houzz, The Wall Street Journal, to Deringhall Décor, 2018’s buzz words create a feeling of home, coziness and warmth. When researching for this article, a few adjectives popped up over and over..comfortable, rich, textured, lived-in, bold, warm, layered, curved and natural. Let’s take a look at the trends, grouped by category. For more information and visual examples of 2018’s Home Décor Trends, be sure to click on the links above! Kitchens- Gone are the days of the all-white kitchens with lots of stainless steel. What’s next to take center stage? Color, think gray/blue, navy and 2018’s Pantone Color of the Year…Ultra-Violet, these colors appear in cabinetry and accents. Warmer wood is also on trend, and shows up in cabinetry, flooring, and even countertops. Also big for countertops, are details and practicality, such as dedicated chopping blocks, baking stations, even antibacterial finishes from K-Life. 2018 also ushers in the rise of the open-floorplan-yet-defined-kitchen, meaning, the home’s floorplan is open and flows from one area to the other, but the kitchen area remains defined structural elements such as columns or a half-wall. More kitchen trends up for 2018, gorgeous fish-scale patterned backsplash, and using the ubiquitous subway tile, but in a larger format to give it an unexpected punch. Darker countertops, quartz rather than granite, trough and bucket sinks round out this updated liveable kitchen feel. Bathrooms- Lush, Luxury, Lived-In…aesthetic seems to be more important than ever in today’s master bathrooms and guest bathrooms. Designers are using wallpaper-like tile, rich colors, concrete accents, high contrast marble, just to name a few. Take a walk through a new builder’s model homes and you are likely to see many of these trends on display. One trend we come across is the wallpaper-like tile. Think of tile with a textured finish, it’s subtle, but makes a powerful statement. Woven textures and natural elements can make for high-impact bathroom accents. You can create a spa-like feel is by opting for a frameless-glass insert for your tub/shower combo rather than a shower curtain. Dark hues for walls, can add drama and depth. Pair those dark hues with the right lighting and you have a perfect space- drama AND good lighting= bliss! Finishes, Fixtures & Color- Finishes in the kitchens and bathrooms are trending toward mixed metals. Designers are talking matte black for fixtures and well-worn brass. According to Elle Decor, Pinterest users searched and pinned “mixed metals” 423% more than last year! Talk about a sky-rocketing trend. You can see this trend beautifully on display at Plano’s newest Granite Park Boardwalk addition, Union Bear Brewery. Vintage Lighting is the crowning jewel in home design. Many of these fixtures serve as art. Pros are seeing a trend in copper. Warm, dark, moody hues are setting the tone for that comfortable, lived-in vibe. Check out Pantone’s Color of the Year 2018!